The B26 ORCA Control Room Monitor adopts its name from the sonic superiority of this apex predator of the sea. The B26 ORCA utilizes the same analog, discrete circuit path philosophy as prior BURL AUDIO products with the emphasis on the ultimate in sonic transparency and 3D stereo imaging. 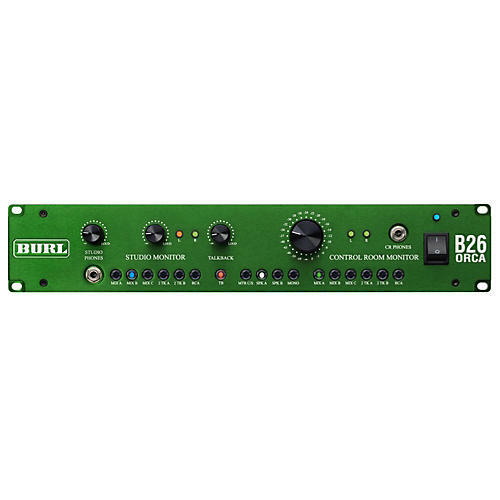 The B26 gives you three separate stereo mix inputs, two stereo tape returns, and a stereo RCA input with corresponding button selection on the front panel to instantly switch from one input source to the next. There's also two stereo speaker outputs that let you connect up to two pairs of your favorite studio monitors for fast mix comparisons, a common practice used by professional audio engineers in just about every major recording facility around the world. Keep tabs on the output with the control room level and external meter output, or use the headphone outputs to mix with your favorite pair of studio headphones. Evolve your listening, mixing and mastering through the B26 ORCA and give you and your ears an unfair competitive advantage.